Last week, we were fortunate to run our second Young Adult Carer Team Challenge residential in partnership GE Aviation. This is a project that I’m really proud of and the residential is co-ordinated by a team of GE’s apprentice engineers to offer young adult carers (ages 16 – 24) an opportunity to develop new skills, build confidence and learn how to work as a team. It’s also importantly some time to have fun and a break from their caring roles! The 11 young adult carers on the residential didn’t stop during the 4 day trip to the Brecon Beacons and our trip included: lakeside lunch, BBQ, a 10 mile walk with team challenges on the route, learning to read maps and navigate, 1:1 coaching, goal setting, MANY games of football, problem solving, teamwork, personal development sessions, ice creams, cooking together, exploring local caves, singing in the minibus, LOTS of hills, washing our hair in waterfalls and making new friends. As a youth worker, the BEST part of the week for me was seeing 11 young people arrive nervous and alone but leave with new found confidence and 10 new friends. On our final day we also had a trip to the beach which for some of the group was their first seaside visit in over 10 years. 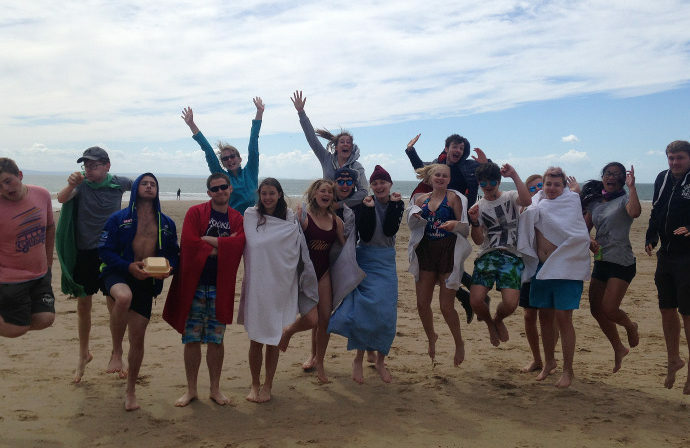 It was a classic British seaside trip: we played rounders, ate chips and paddled in the sea. One young adult carer hadn’t been on holiday since they were 3 so spent the whole day swimming! HUGE thanks to the young adult carers who took part for throwing themselves wholeheartedly at the challenges and to GE Aviation for making this residential possible. The whole team – Nicole, Meeli, Ben, Andy, Tom, Margaret and Harry – worked incredibly hard to provide a great week and were excellent mentors to the young people!